Festival season is creeping up fast and concertgoers everywhere are scrambling to get their live music needs in order. If Jungle Jam isn't already on your radar for next month, it should be—STAT. Located in Jaco Beach, Costa Rica, this three-day-event provides concertgoers with a totally unique experience on the sand, including awesome bands, delicious local cuisine, and multiple onsite activities (beachside yoga, anyone?). For its seventh annual event on March 10-12, Jungle Jam will bring a fantastic mix of international reggae, rock, and jam bands to the table. To tell us more about this festival in paradise, we chatted with founder, Eric Freitas, to learn about what this year's event has in store for live music fans. Freitas gave us the inside scoop on what to expect, a little bit of the event's history, and how to ensure you don’t miss this one-of-a-kind celebration. Take a look at our interview below, then head to their website to buy your tickets ASAP! Jungle Jam is coming right up. Give us the who, what, where and when of Jungle Jam. Jungle Jam takes place in the fantastic beach town of Jaco, Costa Rica on March 10, 11, and 12. 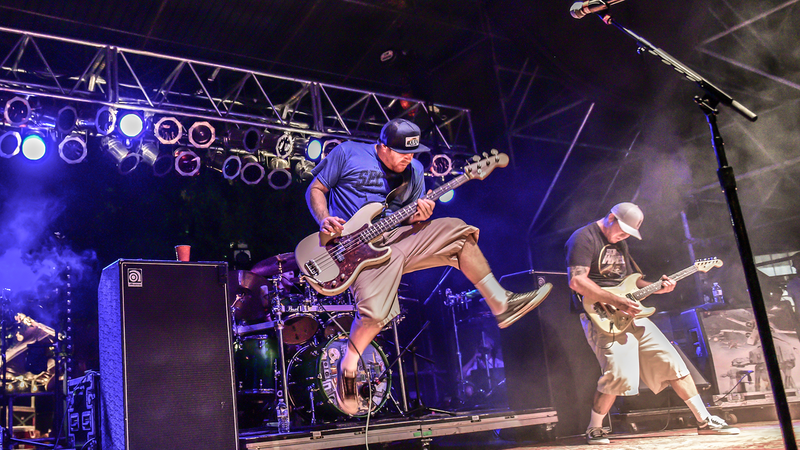 The festival features Slightly Stoopid, Thievery Corporation, Stick Figure, Twiddle, Fortunate Youth, Zach Deputy, HIRIE, Mike Love, Rob Garza DJ Set, Organically Good trio, Santos Y Zurdo, Congo Sanchez, Sonombulo, FEATherWOLF, Matt Carey Matos, Selecta Coco, Docta Rythm Selecta, and Cypher One. We have VIP packages available that include private performances on Thursday, March 9 with Stick Figure, Twiddle and probably a bunch of guests, plus exclusive access to select after-hours concerts and other special events along with a variety of perks. Lodging, ground and transportation. VIP is the way to go. Tell us about Jungle Jam – how did it come to be? I first came to Costa Rica in 2008 for a show at Hotel Docelunas with Scott Murawski of Max Creek, Bill Kreutzmann of the Grateful Dead and Mike Gordon of Phish. They played a benefit at Docelunas and raised funds to build a local school. I ended up falling in love with the country and my 5 day trip lasted over a month. In 2010 I partnered with Docelunas to do the first Jungle Jam and we have been growing every year. Jungle Jam has grown over the years – what will be different this year? It started as a party for a few hundred and has grown every year. This year is going to be the biggest change as we have outgrown Docelunas and are moving to a lot on the beach. I love Docelunas but the space this year is wide open and right on the beach, there will be plenty of room for everyone. Most people who attend Jungle Jam are staying within a 5-10 minute walk of the festival site. Tell us why people love Jungle Jam? Everyone has a good time at Jungle Jam. Last year one of the most fun things I got to do was the day before and the first day of the festival. I walked around the neighborhood and gave tickets to all the neighbors as a thank you for putting up with us. It was a lot of fun because they all love Jungle Jam and just listen to the music from their porches and yards. One grandmother was the only person in one house that wouldn’t take a ticket; she insisted she was too old and I gave her a ticket anyways and I saw her that weekend smiling away watching Sonumbulo play. Anyone who can appreciate good music and dancing will have the time of their lives at Jungle Jam. What other activities other than the music will attendees have to look forward to? Jungle Jam is definitely more than just music. 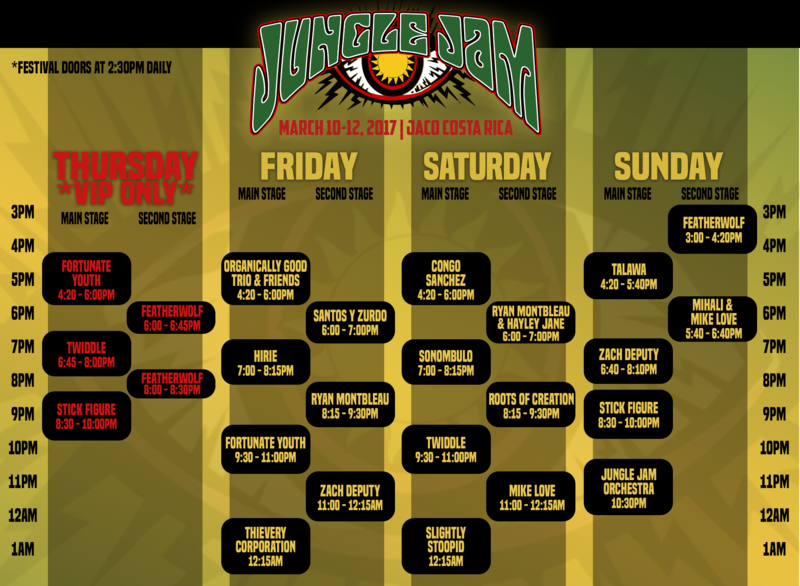 Every day at Jungle Jam starts with live music yoga. Daily excursions are offered and these allow people to really experience the beauty of Costa Rica, often times with band members joining in. There are eco tours, sport adventures and excursions including trips to the rain forest, croc tours, a hike through Manuel Antonio National Park that ends on the beach, surfing lessons and so much more. These are worth checking out and all the various choices are right on our web page. Each night at the concerts, we have local food available, art, fire dancers and other surprises. Why should people come to Jungle Jam? Honestly, Jungle jam is one of the best live music parties in existence. "We celebrate life, nature, music and arts. It is a place to come and be yourself and dance, make lifelong friends and see in an incredible part of the world." Easy – jump right on to our website at www.junglejam.com. Airfare is easy too – most of the major carriers fly to Costa Rica. Don’t forget, the VIP ticket is worth the few bucks extra!